Haven't been able to get on my WC site for a long time but need to. I open Wincustomize and at the top click on DaveBax and Profile. I see the second image below. No where can I get on my Wincustomize site. Haven’t been able to get on it for a long time from this location. However if I made a comments on a skin or any forum page clicking on my name there would take me to my WC site. That no longer works. In fact clicking on my name on a Forum will take me to the same Profile page. Also clicking on Upload or Subscriber Skins does take me to those locations. Note: I have tried Chrome, Opera, and IE on win 7 and Explorer and the others Browsers on Win10. Also tried it with Ad Blocker on and totally off. Actually when I click on your name here I go to the page I can't get on. 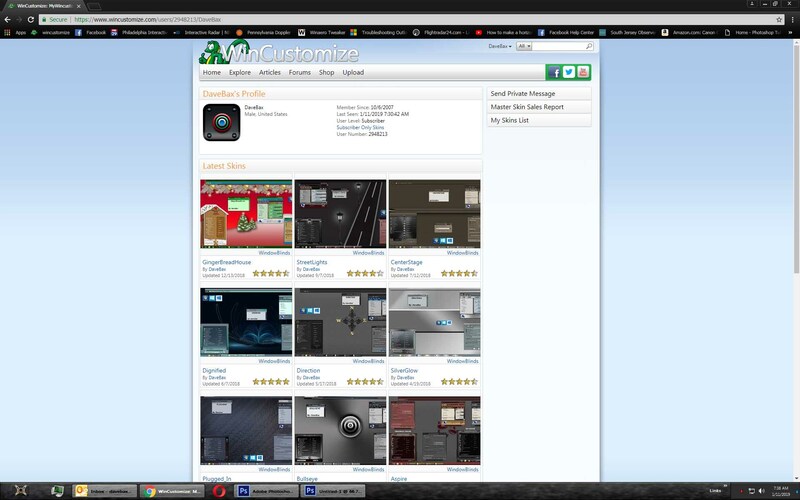 When I click on where it says "Wincustomize Site" I go to the page that I posted the image in. It appears when I click on My Profile it does't take me to the page the has my starting date, location, etc. All that info. I will wait as someone will reply. No big rush. Are you talking about the very old WC personal page sites? On this post where you posted click on your name a menu will show. Click on "View Island Dog's Profile. This will open a page that shows your. Member since, member number, Location, Gender, Marital status, etc. I use to be able to go on any post I said something on and click my name davebax and get to the page. Now it just gives me what my image shows. Get the what the image shows by clicking on ny name on a forum post or clicking my name if I'm just on WC at the top of the page. OK. So I can get to the page I mentioned above by clicking my name next to my reply and clicking "View Davebax's Profile". However but not from any other page I replied. So does this mean anytime I want to get to it I have to make a thread and comment on it. Oh well. It is what it is. No plans to lose sleep over it. lol. We haven't supported the old WinCustomize personal pages in a long time. Links have been long removed, however, the old sites are still there. You just need to know the link.